Bible 101 The Early Church. 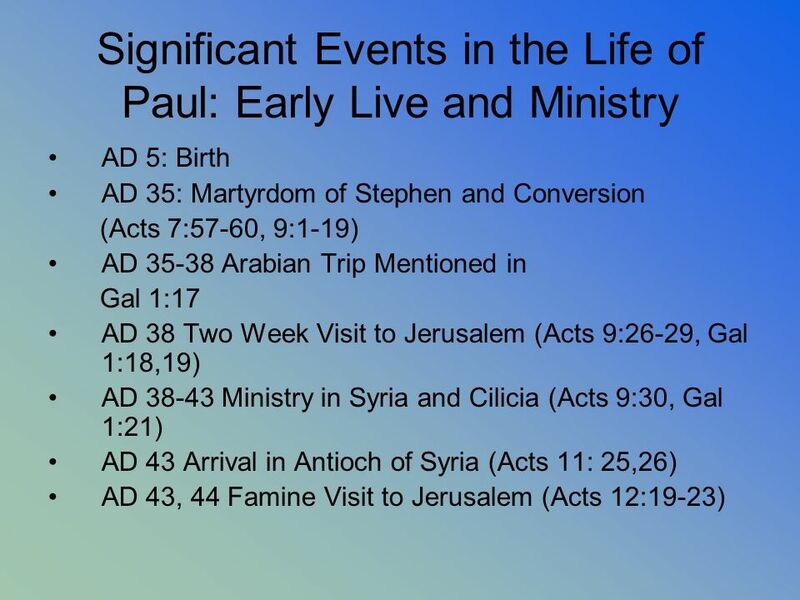 The conversion and work of Paul is tied inextricably to the spread of the gospel in the first century. No other single individual is more responsible for the spread of the gospel in the first century. 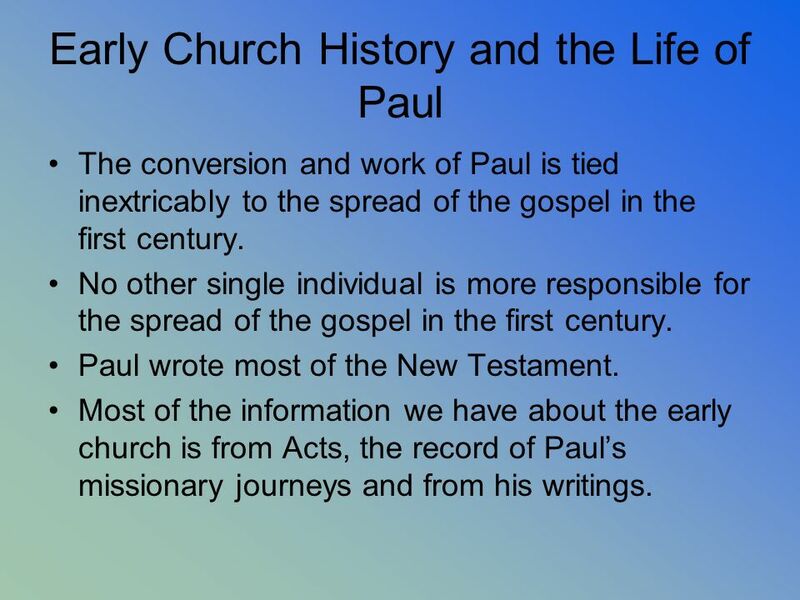 Paul wrote most of the New Testament. Most of the information we have about the early church is from Acts, the record of Paul’s missionary journeys and from his writings. 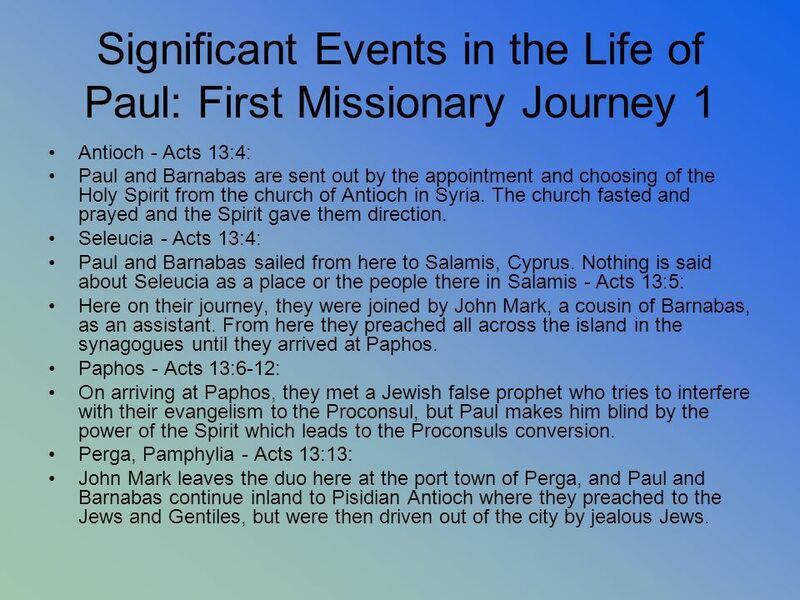 Antioch - Acts 13:4: Paul and Barnabas are sent out by the appointment and choosing of the Holy Spirit from the church of Antioch in Syria. The church fasted and prayed and the Spirit gave them direction. Seleucia - Acts 13:4: Paul and Barnabas sailed from here to Salamis, Cyprus. Nothing is said about Seleucia as a place or the people there in Salamis - Acts 13:5: Here on their journey, they were joined by John Mark, a cousin of Barnabas, as an assistant. From here they preached all across the island in the synagogues until they arrived at Paphos. Paphos - Acts 13:6-12: On arriving at Paphos, they met a Jewish false prophet who tries to interfere with their evangelism to the Proconsul, but Paul makes him blind by the power of the Spirit which leads to the Proconsuls conversion. Perga, Pamphylia - Acts 13:13: John Mark leaves the duo here at the port town of Perga, and Paul and Barnabas continue inland to Pisidian Antioch where they preached to the Jews and Gentiles, but were then driven out of the city by jealous Jews. AD ? Antioch - Acts 15: 36-41: Paul and Barnabas separate because of a disagreement over John Mark because he deserted them earlier and did not help. 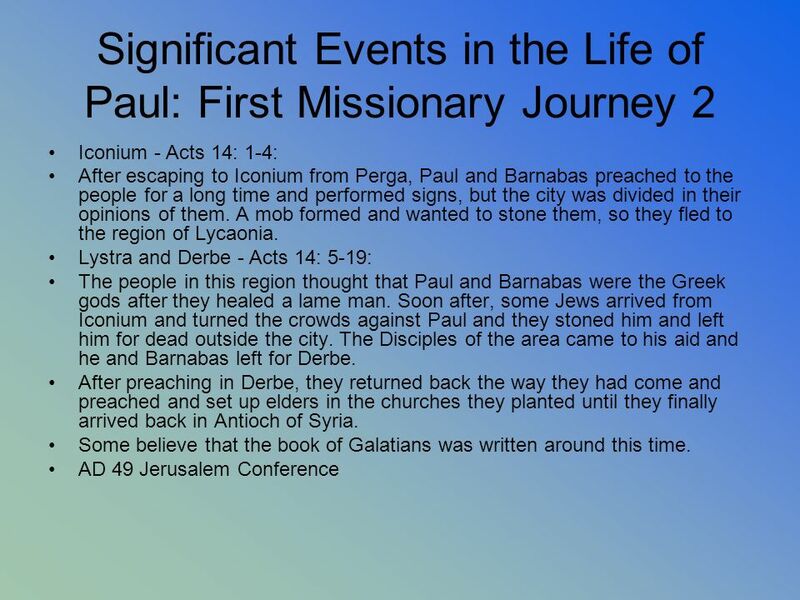 Barnabas took John Mark to Cyprus and Paul took Silas to Derbe. Derbe to Lystra to Iconium - Acts 16: 1-7: Paul and Silas traveled through Derbe to Lystra where they met Timothy who joined them on their travels. From there they went to Iconium and preached in the towns. 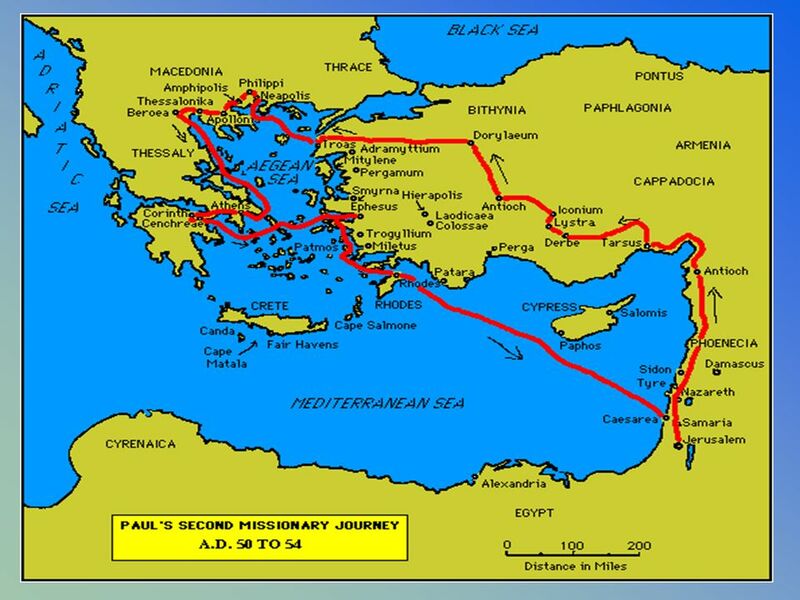 Troas to Neapolis to Philippi - Acts 16: 8-40: In Troas, it would appear that Luke has joined them on the journey as the writing of Acts suddenly changes from "they went" to "we went". 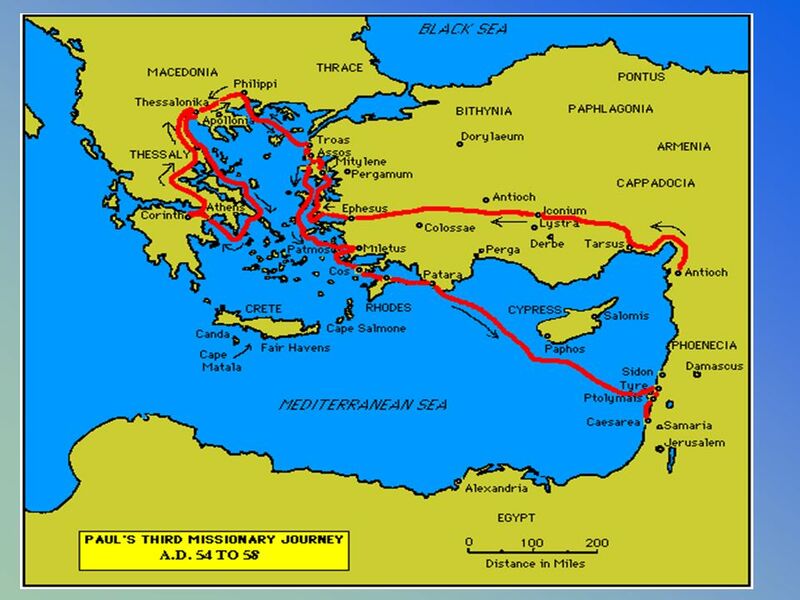 From here they sailed out to Neapolis for a day and then moved on to Philippi. In Philippi, they met a woman who converted and let them be guests in her house. A demon-possessed girl came to the group and Paul delivered her which resulted in their arrest. Somewhere around this time, Luke seems to have left them as the writing style changes yet again to a 3rd person narrative. After being released, they made their way via Amphipolis and Apollonia to Thessalonica. 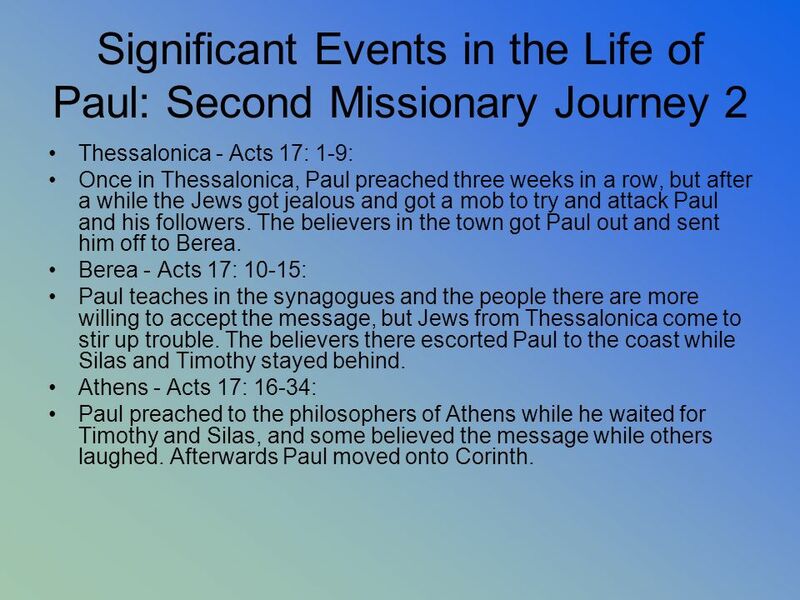 Thessalonica - Acts 17: 1-9: Once in Thessalonica, Paul preached three weeks in a row, but after a while the Jews got jealous and got a mob to try and attack Paul and his followers. The believers in the town got Paul out and sent him off to Berea. Berea - Acts 17: 10-15: Paul teaches in the synagogues and the people there are more willing to accept the message, but Jews from Thessalonica come to stir up trouble. The believers there escorted Paul to the coast while Silas and Timothy stayed behind. Athens - Acts 17: 16-34: Paul preached to the philosophers of Athens while he waited for Timothy and Silas, and some believed the message while others laughed. Afterwards Paul moved onto Corinth. Corinth - Acts 18: 1-18: Timothy and Silas rejoin Paul (18:5) After the Jews insult Paul and his teachings, he moves on to preaching just to the Gentiles at Titus Justis' home. The Jews tried to have Paul arrested but their plan failed so Paul left to go back to Syria taking Priscilla and Aquila with him. It was around this time that Paul wrote 1 Thessalonians and then a few months later he wrote 2 Thessalonians. Ephesus to Caesarea to Jerusalem to Antioch - Acts 18: 19-22: At Ephesus, Paul left the group behind and went to the synagogue. 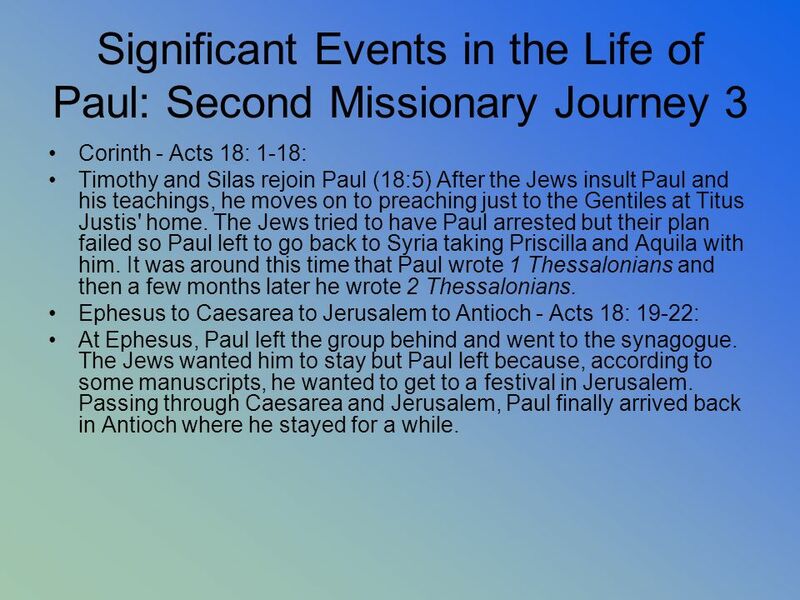 The Jews wanted him to stay but Paul left because, according to some manuscripts, he wanted to get to a festival in Jerusalem. 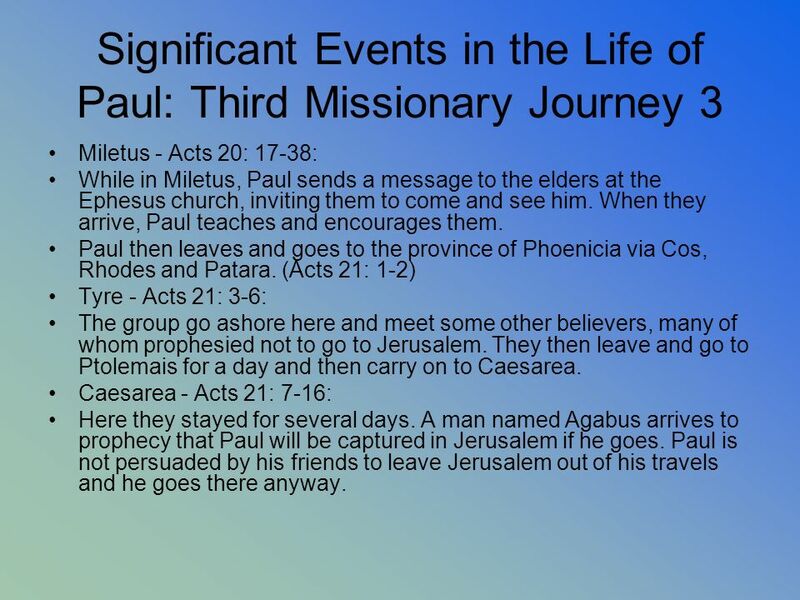 Passing through Caesarea and Jerusalem, Paul finally arrived back in Antioch where he stayed for a while. AD ?? 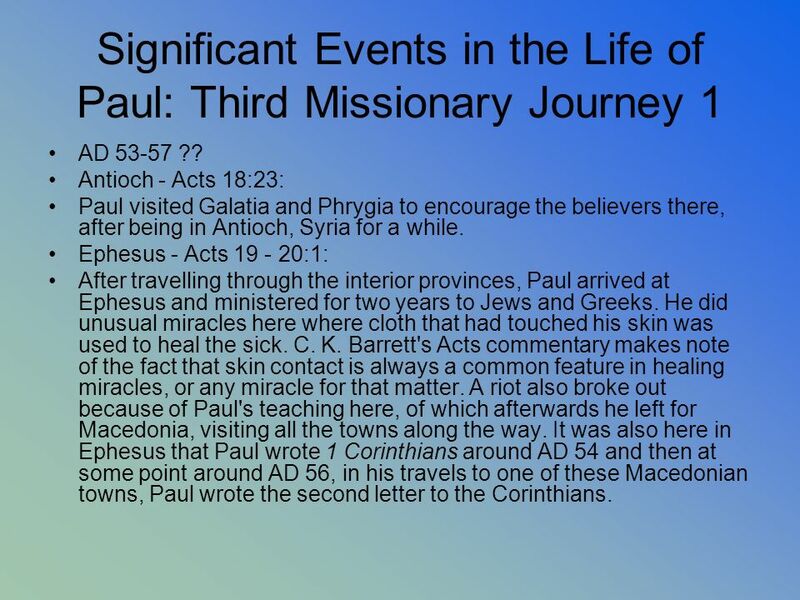 Antioch - Acts 18:23: Paul visited Galatia and Phrygia to encourage the believers there, after being in Antioch, Syria for a while. Ephesus - Acts :1: After travelling through the interior provinces, Paul arrived at Ephesus and ministered for two years to Jews and Greeks. He did unusual miracles here where cloth that had touched his skin was used to heal the sick. C. K. Barrett's Acts commentary makes note of the fact that skin contact is always a common feature in healing miracles, or any miracle for that matter. A riot also broke out because of Paul's teaching here, of which afterwards he left for Macedonia, visiting all the towns along the way. It was also here in Ephesus that Paul wrote 1 Corinthians around AD 54 and then at some point around AD 56, in his travels to one of these Macedonian towns, Paul wrote the second letter to the Corinthians. Greece - Acts 20: 2-6: On arriving in Greece, Paul stayed for three months and then planned to go back to Syria. Around the year AD 57, whilst Paul was in this area, he was likely to have written the letter to the Romans (I believe Galatians may have been written around the same time). A Jewish plot against his life was made so he decided to return through Macedonia instead. Several men join the journey at this point and it appears Luke is back with Paul again as the writing has changed back to the 1st person: 'They went ahead and waited for us at Troas.' (Acts 20:5) They then boarded at Philippi and sailed to Troas. Troas - Acts 20: 7-16: Paul preached here for a week, and during that time, someone fell from a window and died, who Paul then raised and sent home. Paul travelled by foot to Assos and met Luke and the others again. They then sailed to Miletus via Mitylene avoiding Ephesus. Miletus - Acts 20: 17-38: While in Miletus, Paul sends a message to the elders at the Ephesus church, inviting them to come and see him. When they arrive, Paul teaches and encourages them. 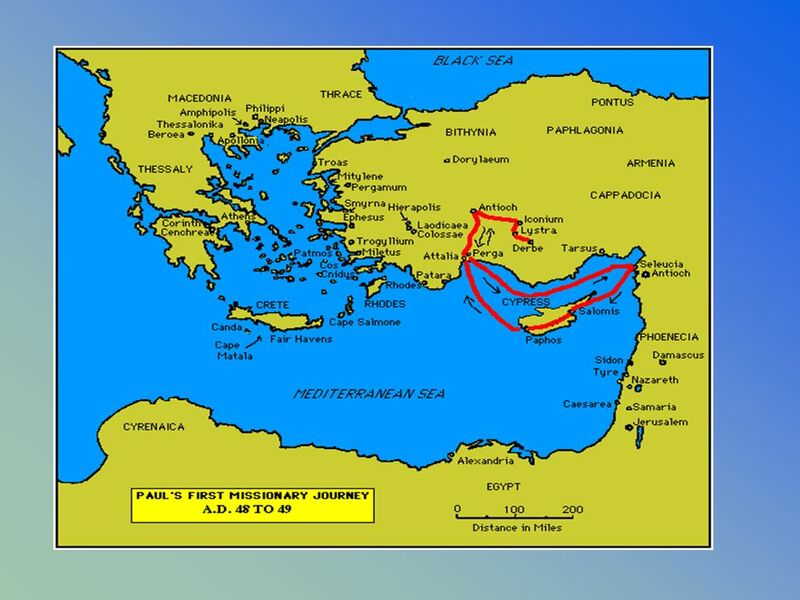 Paul then leaves and goes to the province of Phoenicia via Cos, Rhodes and Patara. (Acts 21: 1-2) Tyre - Acts 21: 3-6: The group go ashore here and meet some other believers, many of whom prophesied not to go to Jerusalem. They then leave and go to Ptolemais for a day and then carry on to Caesarea. Caesarea - Acts 21: 7-16: Here they stayed for several days. A man named Agabus arrives to prophecy that Paul will be captured in Jerusalem if he goes. Paul is not persuaded by his friends to leave Jerusalem out of his travels and he goes there anyway. AD 57 Arrest in Jerusalem (Acts 21:27 – 22:30) AD 57 – 59 Caesarean Imprisonment (Acts 23:23 – 26:32) AD 59 – 62: Shipwreck Voyage to Rome and House Arrest (Acts 27:1 – 28:31) Wrote the “Prison Epistles” while under “house arrest” in Rome. These are Colossians, Ephesians, Philemon, and Phillipians. 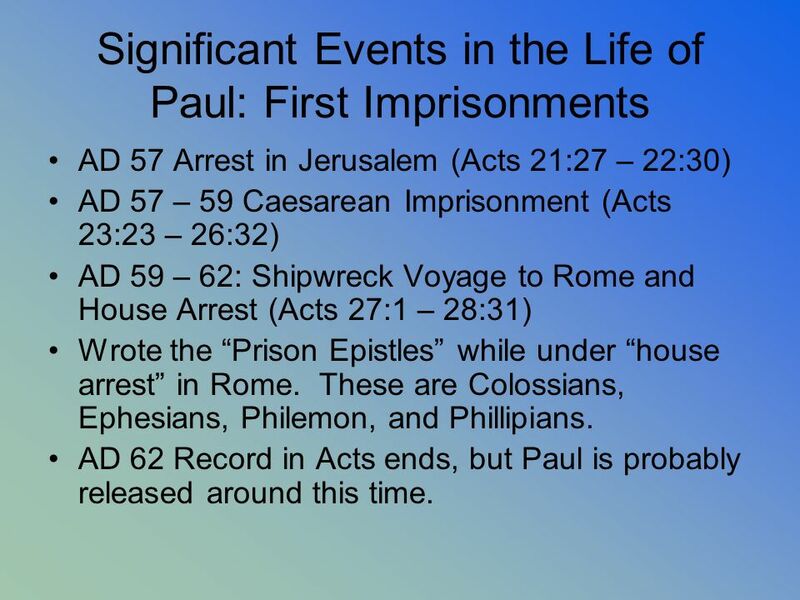 AD 62 Record in Acts ends, but Paul is probably released around this time. 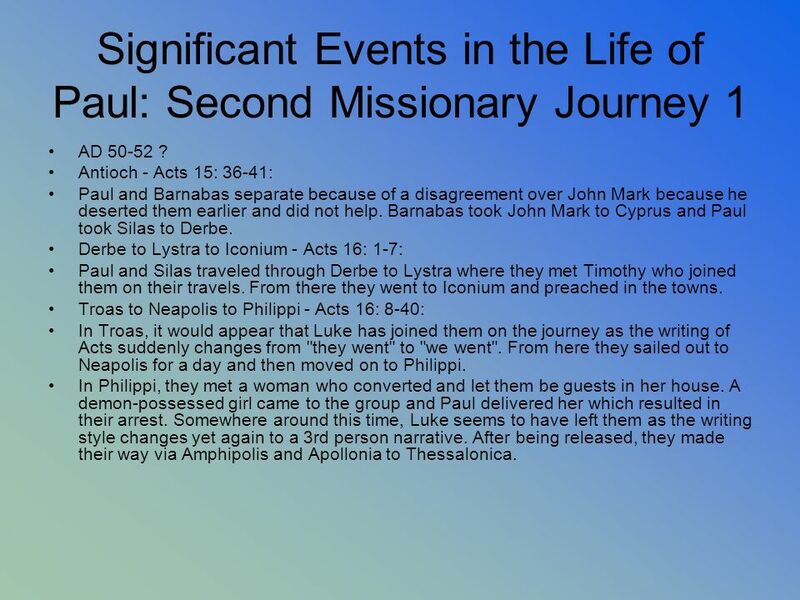 19 Significant Events in the Life of Paul: The FOURTH Missionary Journey? 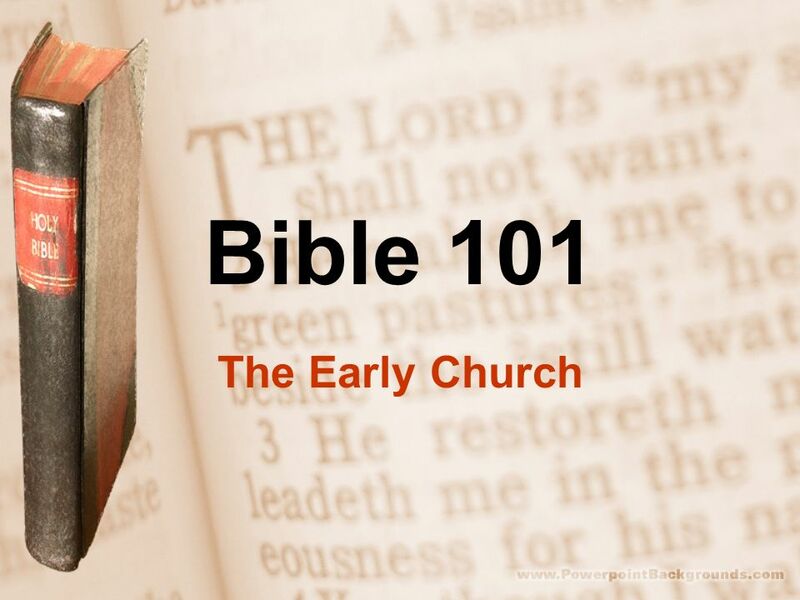 Download ppt "Bible 101 The Early Church." Introduction to Ephesians 24 September Basic Background Questions Who? Where? When? What? Why? Paul took Silas and went through Syria and Cilicia, strengthening the churches. Passing through Derbe and Lystra, they included Timothy with their group. 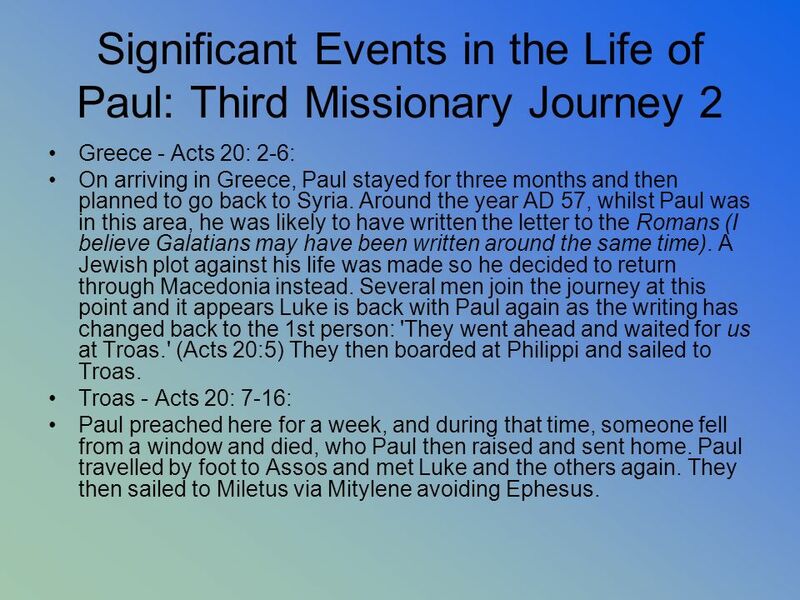 PAUL’S 2 ND JOURNEY ACTS 15:36-16:15. 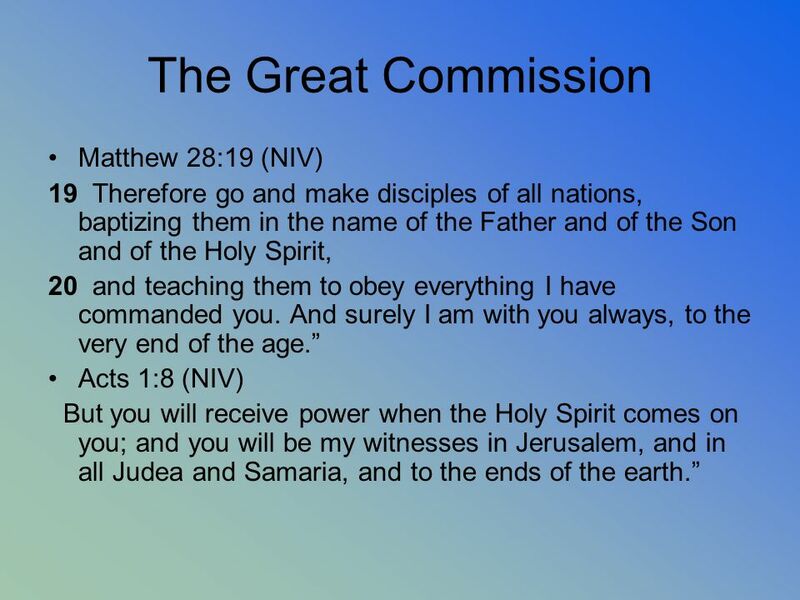 THE OUTCOME OF THE JERUSALEM COUNCIL So when they were sent off, they went down to Antioch, and having gathered. 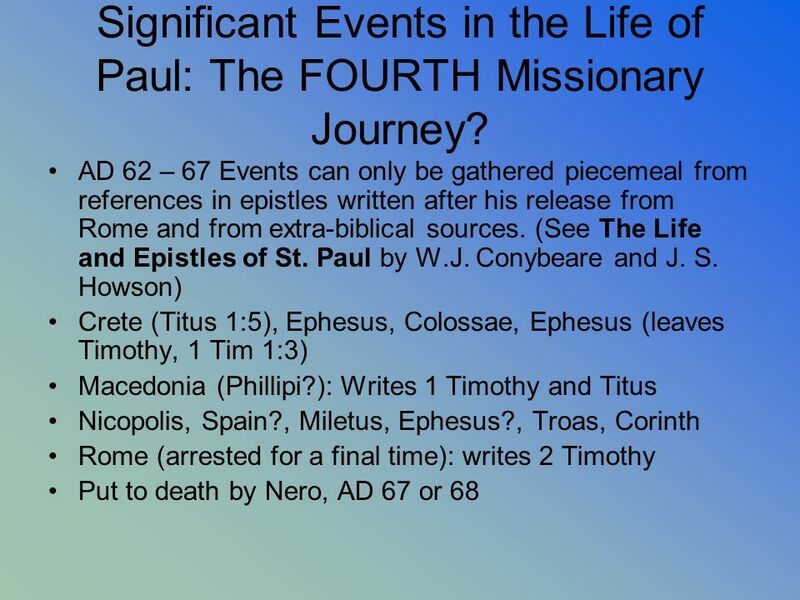 On The Move with St. Paul Missionary Journeys and Epistles. “I, PAUL” SCRIBES & COMPANIONS WHEN NECESSARY, USE WORDS. The Word of this Salvation. Gospel Work in Antioch (Acts 13:1-2) Edification, 13:1 Edification, 13:1 Unity, fervent devotion Unity, fervent devotion Ministered. Follow the Leader Acts 1-21 (An Overview) Message 6 in our 14-part series on the Acts of the Apostles. Sunday, August 10, 2014 Speaker: Peter Benjamin. 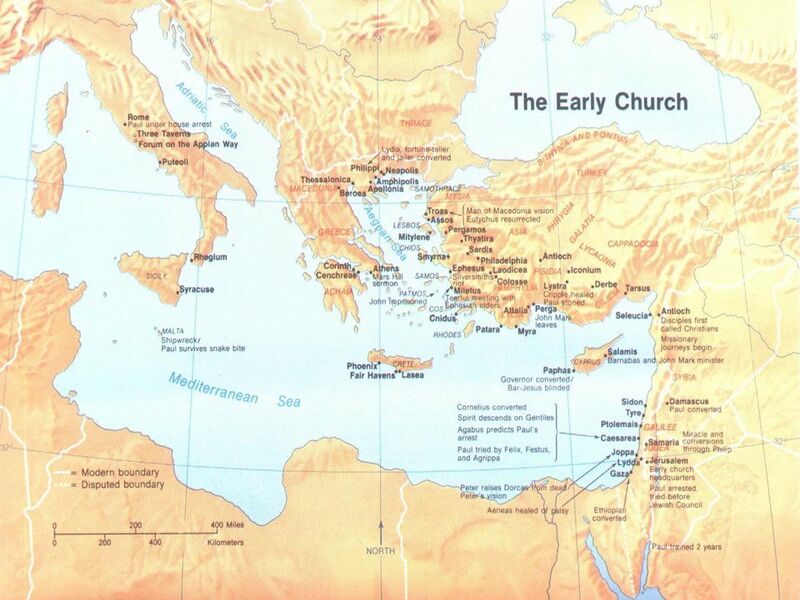 Acts of the Apostles, #4 The Expansion of the Church to the Gentiles (to the remotest part of the world) Acts 11: :16. 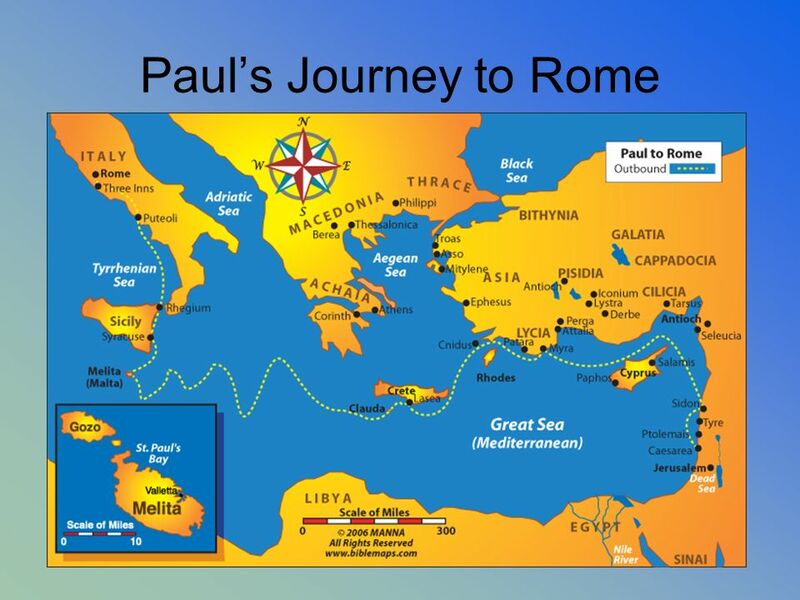 ST PAUL’S JOURNEY BY:LETIZIA/5C. 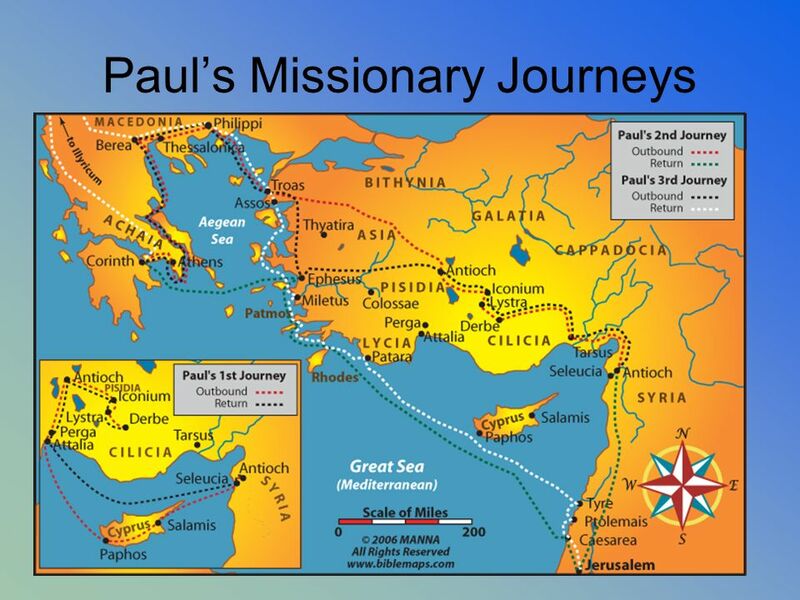 ST PAUL JOURNEY: “GALATIA” 1 st Missionary Journey to Galatia: A.D (Acts 13:4-14:28) 1. Departed from Antioch.  1. Bar-Jesus, a false prophet, is blinded. Proconsul Sergius Paulus is converted.  2. John returns home.  3. Paul & Barnabas preach to Jews and Gentiles. Acts The New Testament Book that Tells the Result of the Incarnation of Jesus. Acts of the Apostles (Chapters Thirteen & Fourteen) Paul & Barnabas Sent (13:1-3). - John Mark (12:25; 13:5; Relative of Barnabas - Colossians 4:10). First. Lesson 4: Gospel spreads to uttermost parts of the world—part 1 (Chapters 12-18) Lessons From Acts.